But for Henry Ford's assembly line, Cleveland might have been the "Motor City." In 1900, there were over 1000 small auto manufacturers coexisting in the United States, over 70 of them in Cleveland. The first auto sold in the US came from Cleveland's Winton Motors; the first car to make use of steel ball bearings was Cleveland's Baker Motors; and the first use of the French word "automobile" in conjunction with the US car industry was by Cleveland Plain Dealer reporter, Charles Shanks, in 1899. One by one Cleveland's auto manufacturers went out of business, but Cleveland and Northeast Ohio continued to be a major contributor of auto parts, steel, glass, and rubber products well into the 1960s. In fact, in 1963 13 percent of Cleveland's work force was employed in some aspect of the auto industry. The Crawford Auto-Aviation Museum was formed in 1963 with the private collection of Mr. Crawford's company Thompson Products at its core. 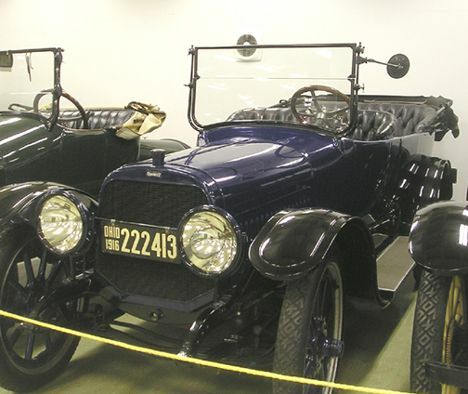 (Thompson Products later diversified and became TRW, Inc.) The museum showcases 200 classic automobiles, among them 80 cars that originated in Cleveland. The Winton Motor Carriage Company, founded in 1897 in Cleveland, was the first American company to sell a motorcar. Created by Scottish bicycle maker, Alexander Winton, the company produced "horseless carriages", which were made by hand and assembled piece by piece. Winton carriages were noted for their padded seats, leather roofs, and gaslamps. The Goodrich Rubber Company of Akron made the tires. The Phaeton pictured above was one of 100 cars the company produced that year, making the world's largest auto manufacturer. It cost $1000. One of the buyers that year was James Packard, who later made his fortune in the Detroit auto industry as owner of Packard Motors. Alexander Winton and his family lived on Lake Avenue against Lake Erie, west of downtown Cleveland. His former property was divided after his death. A portion of it is home to the luxury Lakewood highrise condo building, Winton Place, for whom it is named. Early auto manufacturers sought to increase their products' visibility by publicity stunts, such as creating the "fastest" car. Winton Motors was no different. In 1901, the company created the "Bullet no. 1" racing car. It clocked a record 53 mph, but later lost in a race with Detroit auto pioneer, Henry Ford. Winton immediately set to work on "Bullet no. 2" (pictured above). He tested the car on, then unpaved and uncrowded, Clifton Boulevard and clocked an unofficial record 70 mph. The car later lost to another Ford driver, Barney Oldfield. In the late 19th century, Frenchman turned Clevelander Louis Hoffman was a successful bicycle manufacturer. Like many bicycle makers, he was intrigued by the new automobiles being crafted in Europe. In 1900, he opened the Hoffman Automobile and Manufacturing Company in Cleveland on Lake St. and Marquette Ave. The first Hoffman cars, available in 1902, were steam-powered, but the company gradually switched to the more popular gasoline-powered engines. Mr. Hoffman sold the company in 1903 and it became known as the Royal Motor Car Company. The 1903 Hoffman General Utility Tourneau (pictured above) is a single-cylinder gasoline-powered car. It seats four passengers and the engine is located under the driver's seat to leave the front available for storage. It is one of 100 such cars produced in 1903. The sticker price was $925. In 1899, Walter C. Baker, a Case Institute graduate, already had his own company, the American Ball Bearing Company. Like others of that age, however, his was fascinated by the automobile and in 1899 created the Baker Motor Vehicle Company in Cleveland with friends, Rollin and Fred White. The Baker Motor Vehicle Company produced electric cars that were so easy to handle that "even women could operate them." The car pictured above was owned by Miss Miriam Norton, the daughter of Western Reserve Historical Society benefactor, David Z. Norton. The two-passenger car's .75hp engine runs on a 12-cell battery. The car's sticker price was $1500. The advent of the electric starter was the demise of the electric car. Baker Motors merged with another Cleveland-based electric car manufacturer, Rauch and Lang, in 1915 and diversified into producing commercial vehicles. The company evolved into the Baker Materials Handling Company, which went out of business in 1989. 1905 Peerless Model 9 "Roi de Belges"
The Peerless Motor Company, founded in 1900 and located at 9400 Quincy Avenue, was a producer of high-quality motorcars. Originally, a producer of clothes wringers and then bicycles, the Peerless name became synonymous with quality. With Packard and Pierce-Arrow, they became known as the "Three P's of Motordom", the "P" indicating Premium cars. It was, ultimately, that quality which led to the auto manufacturing company's demise. The car lasted on the average of ten years, far longer than their competitors' cars. Then, after the stock market crash of 1929, many fewer people had the funds for such cars. The Peerless brand lasted until 1932, when the company transformed itself into a brewery, producing Carling's "Black Label" brew well into the 1970s. The car pictured above, "Roi de Belges" or "King of Belgium", was the middle of the 1905 line. It retailed for $3500 (a small fortune in 1905). In 1897, 17-year-old Frank B. Stearns, dropped out of school to pursue a career building that new-fangled contraption -- the automobile. With two friends, he set up a machine shop in his family's garage at Euclid Avenue and Republic (now E. 101st Street). His father was impressed that he fronted his son the money to expand into the family's barn, where Frank created a manufacturing shop. In 1902, he moved the successful firm to Euclid Ave and Lakeview Rd. as the F.B. Stearns Co.
By 1910, the company was producing 100 cars each year and by 1912, they had branches and dealerships in 125 cities. Production grew to 3850 units in 1925, but expansion all but bankrupted the company and it was sold that year to Willys-Overland Company in Toledo. The company never recovered and was dissolved in 1929. The car pictured above is a five-passenger touring car, which sold for $3375 in 1910. The car is powered by a four-cylinder engine, 30hp engine. The Baker Motor Vehicle Company produced electric cars that were so easy to handle that "even women could operate them." The WB Roadster, pictured above, is an electric car, run off of a 48-volt battery. It was a small, sporty model, with just a 87" wheelbase. It retailed for $2300. Cleveland's Chandler Motors was founded in 1913, a manufacturer of mid-priced automobiles. By the early 1920s, they were the largest auto manufacturer in Cleveland and the nation's 13th largest. Chandler was known for their car's quality construction. The company continued to grow and, in 1928, sold to Hupp Motors. The Great Depression was especially rough on makers of mid-priced products, and by 1930, the company was out of business. The Model Six, pictured above, is the least expensive Chandler model of 1916. The six-cylinder touring car seats seven passengers -- two in front, three in the back, and two in jump seats. It retailed for $1295. Cleveland's White Sewing Machine Company had been a thriving manufacturer of sewing machines, roller skates, phonographs, kerosene lamps, and machine tools, among other things, since 1866. Thomas White, however, was not interested in automobiles until his son Rollin, who had worked briefly for Baker Motors, began studying them at Cornell. In 1900, Rollin returned home to make four steam-engine prototypes and by 1906, the White Sewing Machine Co. manufactured 193 vehicles. The auto division separated that same year and moved to a new plant at E. 79th and St. Clair. White eventually switched to gasoline engines around 1909 and then to the manufacture of heavy trucks. The company stayed in business until the mid-1970s. The delivery truck pictured above is typical of the company's customized trucks.